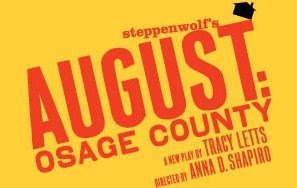 Last week, I finally returned to Tracy Letts' August: Osage County after having been blown away last August by his absolutely brilliant, riotous script and the stellar performances by its Chicago-based Steppenwolf cast. While some of the casting has changed for its Broadway run, the show runs even deeper, more visceral the second time around. It hasn't lost any of its dramatic punch -- if anything, it hits even harder with greater precision that I would not have even thought possible. Credit Anna D. Shapiro for sharpening this play into a razor-sharp, whip-smart American classic. And it's even funnier, too. Although my original SOB Review summarizes the way I still feel about August: Osage County, there is always a joy in seeing a truly exceptional work for a second time because you're able to appreciate all the underlying nuances that may have slipped by the first time. While Letts never shies away from an in-your-face verve, he also infuses plenty of subtle charm, particularly in capably bringing his softer moments full circle. One prime example lies within the shades of patriarch Beverley Weston seen in daughter Barbara's eleven o'clock Jim Beam swilling soliloquy. Sure, both Beverley and Barbara were rambling on in front of the hired help, but both were on a search for their very souls. Another fine example derived from Beverley's one and only appearance comes from his haunting exhortation of T.S. Eliot, only to see the great poet's work offered up by that same hired help to comfort one key character. In addition to luxuriating in the play's artful undertow, I also found myself more deeply immersed in each of the fully realized characterizations. Yes, there is still no denying that Deanna Dunagan (Violet) single-handedly delivers a bravura performance for the ages as the matriarch of the Weston clan. Amy Morton still gives as good as she gets -- and even better -- as Violet's daughter Barbara. And Rondi Reed's Mattie Fae is still likely to remind you of your favorite, if she wasn't so crazy, aunt. These three actresses are all at the top of their game and will surely be remembered come Tony time. Yet it was the performance of Francis Guinan as Mattie Fae's long-suffering husband Charlie that really popped for me the second time around. While no character in this show is without their own dynfunctional imperfections, Guinan offers a sweet dignity to the proceedings, especially when considered against one of the play's many revelations exposing the startling truth about his own son. Additionally, Mariann Mayberry -- who, like Guinan, is a Steppenwolf ensemble member I've admired in countless roles in Chicago -- offers such a wonderfully delusional turn as Violet's daughter Karen, pretending to have discovered the secret to happiness (equated to New Year's wedding bells and Belize), even though her world is crumbling around her for everyone else to see. By far the best-written, best-acted play I've ever seen at Chicago's Steppenwolf -- and that's no small feat -- August: Osage County is ensemble member Tracy Letts' masterpiece. To say it's the most excellent stage production I've seen this year would be a gross understatement. Six months later, after much reflection, I can attest that this is the best new stage play I've seen over the last five years. Now that the show is enjoying an open-ended Broadway run, do yourself a favor and see it in all its glory. I'll be seeing this show for the fourth time. I know what you mean about Francis Guinan's performance. The women's roles are so strong, I think the men run the risk of being overshadowed. But there's one scene where he and Rondi Reed's character are having it out over their son, and he was terrific. He says something that surprised and touched me. I agree with you that Rondi Reed is great. I loved the banter between the two of them at the beginning. Did you see any big differences from the Steppenwolf production? I'm assuming it's in a bigger theater now. I don't know whether that affects things. What did you think of Madeleine Martin as the daughter? I'm so glad you saw the play in Chicago and were able to report back so enthusiastically about it. Your review definitely convinced me to see it in New York in November! Anonymous, I could easily see it a couple more times. Esther, Madeleine Martin was about the best child actor I've seen on the stage. Very strong, very believable. "Because We Don't Laugh At Sad People"